Everyone involved in our industry over the past few years has seen many of our beloved conifers hit by successive rounds of disease and there have been increasing calls to consider our long term options. At Alba, we began to grow ‘alternative conifers’ so that we could provide plants for trials, but also find out more about how these species can be best grown on the nursery. Whilst foresters are looking at silviculture and sawmillers are looking at timber values, the nursery trade must look at growing these trees to an acceptably high quality standard at the lowest price, so Alba has been trialling many different growing methods to reduce the cost to the minimum possible which will allow industry to make an informed decision about the viability of each species. Aim: Improve the level of understanding around conifers while also providing a valuable forestry learning resource to improve the knowledge and skills of the forestry sector as a whole. Raise awareness for the value both commercially and socially of conifers in the UK. Provide forestry/arboriculture students with the opportunity to gain practical forestry learning opportunities. Provide colleges with a forestry based onsite learning and research facility. 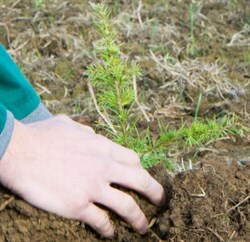 On 5 November 2014, the project was launched with the first planting at Moulton College and we wish it all the very best and hope that it contributes to the learning of our young foresters. This entry was posted in Uncategorized on January 1, 1970 by union.